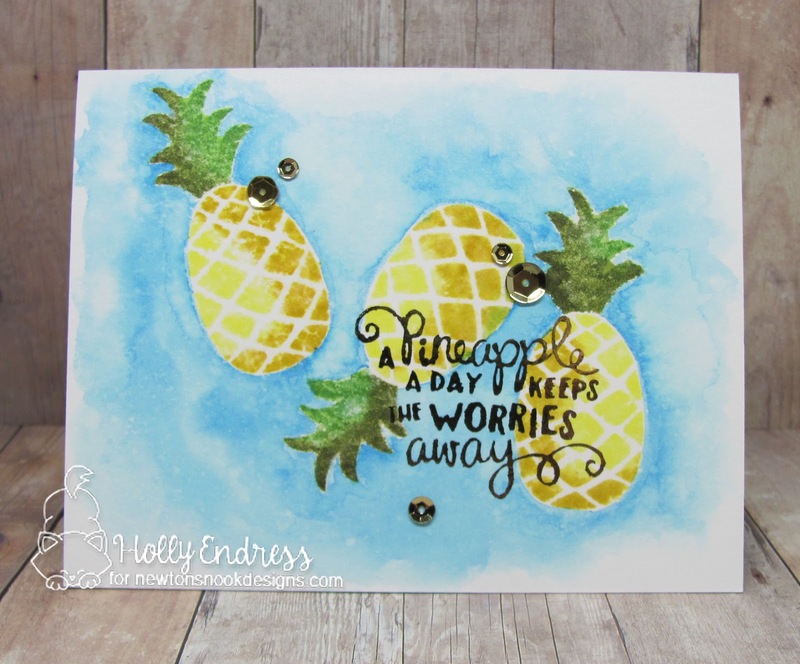 Hollybeary Creations : Keep the Worries away!! Hi everyone.. I hope you are having a great week so far. 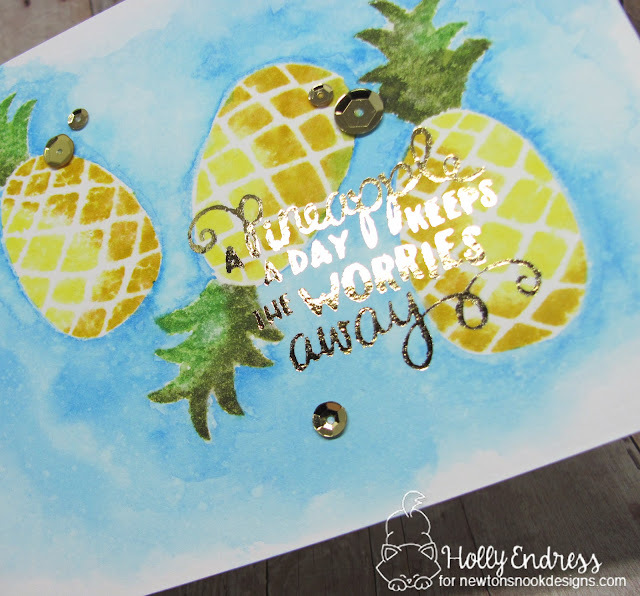 Today I have a fun card for you using the Newton Nook's Pineapple Delight Stamp and die set. I did a card back in the Summer featuring the Tikki Time stamp set and Distress inks. I loved how that card came out with the Distress Inks and a solid image stamp. So I decided to use the same technique with the Pineapple set. I started with a piece of Watercolor paper and I stamped the pineapples in Squeezed lemonade & Mustard Seed ink and spritzed it with water before stamping onto the paper. I repeated this process for all three pineapples. Then I did the same thing with the tops using Mowed Lawn and Peeled Paint Distress Inks. I dried the panel with my heat tool and went back in with some Salty Ocean ink and added the blue background. To get the soft washed out look you wet the area first then drop in the ink with a wet paintbrush and let it spread naturally adding more ink as needed. Once everything was dried I stamped the sentiment using a Minc Toner Pen onto the front of the card. Then I ran the card front through the Minc machine with some Gold Foil. This is also a good way to help flatten out a Watercolor piece. I adhered the image to a Green card base and added some Gold Mixed Sequins. 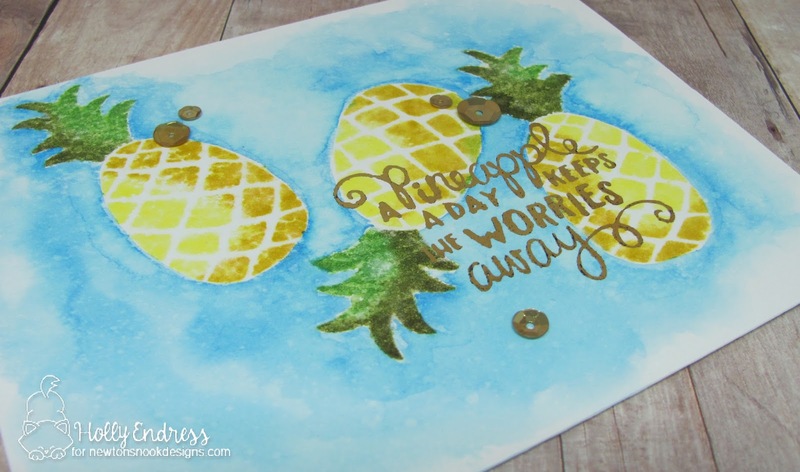 This is such a Fun card and a great way to use Distress inks for Stamping. I have a video below for the Tikki card I mentioned above showing the Technique. Thanks for stopping by.. for more inspiration from Newton's Nook be sure to head over to the Blog.